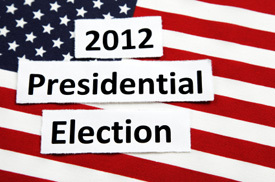 In the fourth episode of the podcast Patrick Watson of The Political Astrology Blog joins me to discuss the astrology of the 2012 presidential election in the United States. During the course of the show Patrick and I discuss topics such as the different astrological approaches to predicting the outcome of the election, the approach that we took in issuing our own prediction on The Political Astrology Blog, Obama and Romney’s birth charts, the inception charts for the Republican and Democratic National Conventions, the Mercury retrograde on Election Day, and the inauguration chart on January 20, 2013. The show is longer than usual, clocking in at a solid 1 hour and 52 minutes, but that is because we covered a lot of ground, as we’ve both been following the astrology of this election very closely. Below you will find the show notes, and then at the bottom of this post you can find links to download or play this episode of the podcast. Intro and background information on our recent work with political astrology. The natal charts of the candidates. The announcement times of the campaigns. The nomination charts at the conventions (which we will talk about more later). The birth chart for the US. Horary charts (which is a bad idea). Also different traditions: Indian, Hellenistic, Uranian, Medieval, Modern, etc. Natal astrology primarily, and then later nomination charts which confirmed our original findings. Primarily used a Hellenistic timing techniques that times peak periods in a person’s career. Also took into account profections and transits. Saturn in Scorpio being more problematic for Obama, but not costing him the election. The nomination and acceptance charts. The big thing is the different ruler of the ascendant. Venus applying to Saturn versus Venus separating from Saturn and applying to Jupiter. Void of course Moon in Obama’s nomination and acceptance speech. The elections for the conventions themselves were pretty good. The DNC chart had a better ruler of the ascendant. Obama got a bounce and Romney didn’t. Stations retrograde at 4 Sagittarius in the evening on Election Day, Nov 6, 2012. Stations direct on November 26 at 18 Scorpio. Moon applies to square Mars. (!) Ominous. Patrick points out that Mars rules the 7th and 12th. Last inauguration that looked like this was 2001. Jupiter in the 2nd, stations direct 10 days later. Mercury ruler of 2nd applying to Jupiter. Looks good for the economy. There are degrees of “voidness” for the Moon. Lilly’s example seems to suggest this based upon the exceptions he states with beneficence or dignity of the Moon. But I think that the Moon can’t really be said to be void when it is conjunct Obama’s midheaven (the Moon is obviously doing something and is not idle in sending its effluents). The Moon as representing the people shows at 29 Scorpio. About your worries on the inauguration chart, I’ve been expecting war with the Aries ingress of 2013. It is not surprising that Jupiter is received by Mercury from the 2nd. Wars are great for bankers. Thanks for this..you did a wonderful job..(Patrick, you don’t sound anything like your photos). Also, I’m thinking that the election technique of looking at the chart for the opening of the polling booths in Dixville Notch, NH is not used any more..it never made much symbolic sense to me (although I can’t recall whether anyone looking at it had good results) and now with all the good data timing available seems even less useful.. I also concur with Curtis about the significance of Obama’s MC at 29 Scorpio, but then as you guys noted, we’ve seen its efficacy already in the 2009 inaugural chart..
And, on the troublesome 2001 inaugural chart: there was a strange incident, a shooting on (or near?) the White House grounds that I noted at the time as it was so eriee – there was such a quick military/police response, an immediate lockdown, and I remember being very struck by the images on tv with much foreboding…it felt like an omen of what was coming…the shooting was on Feb 7, 2001 at 11:22 am..Saturn on the Asc at 24 Taurus, Mars at 26 Scorpio.. Thanks again, I’m looking forward to the first debate with you all.. This is the type of simplistic thinking that we discussed at one point in the podcast. You might want to listen to the show. Another fantastic job with in depth coverage and thoughtful insights into the many charts involved. I have also had my doubts about Morrison having accurate data for all of the nominations. Thank you for again clarifying the different definitions of VOC Moons. That topic, like Morrison’s data, has not received enough careful examination, though with this election, maybe it will. As always, looking forward to more. Amazing that there is no discussion on eclipses, based on the outline above. You guys are young, maybe go to a Merriman seminar. You are going to learn something this election. Eclipses *are* mentioned in the outline above, and we did discuss them briefly in the podcast. Hopefully you will learn to read at some point in your old age. OK, I see you did cover it a bit. My bad on the quick. I see it differently, we will see how it turns out. Given how the eclipse one week after effects Romney’s progressed Jupiter and his 10th Sun, that is something that you could have noticed. I think they both imply winners to a degree, which goes along with my expectation there is an EV winner and a PV winner. Hi Chris and Patrick, ( I agree with Mary- Patrick -re your voice, it’s interesting how we may feel a person’s photo gives us an impression of what to expect) doing great job Chris. Open, polite and wide ranging discussion…… Just finished listening…yes a little late on this one…. The first comment I have is; in mundane work if we are to be taken seriously then we should be able to show our techniques over many examples. Our modern mundane political structure alludes to (free) independence of Government. And if we follow Nicholas Campion’s reporting of historical Proclamations, then why wouldn’t we make use of a chart that I have not heard mentioned very much, which is the US proclamation, which was read according to Nic (P-366 TBWH, revised 2004) at 12:00pm, State House Square in Philadelphia on July 8th 1776. This chart from my research does hold up when subjected to applied research. I point to 9/11 as the most recent; Terrorist attack, 12th whole sign is Virgo, Transiting Mercury lord, conjoined to natal Saturn on the Asc. Natal Saturn lord of the Homeland 4th place. Trs Saturn conjoined to Porphyry 9th place cusp trine ASC. Trs Moon conjoined separating natal Mars. My following point is making use of Ingress charts, which you can find an example of on my website. The Libra ingress…..In this delineation I do make mention as you have alluded to about a delayed outcome and also go into the following comments about the following procedure. On November 6th 2012 the US race for the White House will move into its final stage. The official counting will take place December 17, 2012 – Electoral College formally elects a President and Vice President. On January 6th 2013 @ 1:00pm EST, Washington DC, the joint sitting of the Congress and Senate will official cast their votes and elected a new President. The constitution says they must elect a President….I say that because the charts are showing some very complex outcomes! The Inauguration of the newly elected President will take place on January 20th 2013. Now you make mention also of the Inauguration date….2013….if we go with the 12:00pm 20th January 2013, then this 19 degree Taurus rising is very strange as it is the degree of the May 9th 2013 annual solar eclipse. Saros cycle 15 south; this series is not known for good outcomes, whereas the prior eclipse, November 13th 2012, Saros 15 north, seems to give more positive outcomes. Saros 15 south was born June 6th 1472, OS. Here’s the correlation…if you look at the above mentioned US 8th July 1776 chart, than you will find Mars at 24 Gemini and this 1472, 15 south has the Sun at the same degree. Also Venus is at 18 Taurus. A another point is that you mention the slip up in the 2009 Obama Inauguration….interesting as I have said many times without being heard that this was a monumental moment, (slip-up) as far as traditional astrology is concerned. If we use the Arabic module then they say for a King this was supposed to be great, or bestow Greatness upon him. But as we now know from his period in office, (as he was sworn in again….we can gage this that… He was not the King of Kings, even though you could argue he was the first Black President. There is a lot more to this outcome as you have mentioned…. a humble note…..I have had very successful results using the above mentioned methods.